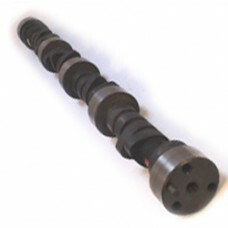 Speed-Pro hydraulic flat tappet camshaft for street use. Dyno results show this camshaft can produce 350HP in a 9.5:1 compression engine. A good choice for achieving increase in power for road use. This cam matched with Edelbrock RPM heads, hardened pushrods, RPM or Torker intake and EDEL1405 carb will produce an economic high power upgrade from a stock engine, yet have good idle and power quality. Can also be used with modified stock heads but will require upgraded valve springs and valve-train etc. Customer must ensure adequate piston to valve clearance, valve spring clearance etc for their own application, however this cam will usually install straight into a stock Chevrolet 350 with Edelbrock RPM heads. Fair idle quality. Designed for Small Block Chevrolet pre-86 style. Advertised duration 304 Int, 287 Exh. Lift at valve .468 Int, .480 Exh.